The Romanian fantasy is a very strange beast or more exactly it is a species that came back from the brink of extinction in another surviving attempt. With a rich mythology and a long tradition of local legends, with two of the most important authors of the Romanian literature, Mihai Eminescu and Mircea Eliade, signing works of the fantastic, it is odd that the genre didn’t thrive with the passing of time. It is very strange that in the dark years of the Communist regime the Romanian fantasy instead of being a welcomed refuge ended up barely holding a weak light. It took more than twenty years after the 1989 Revolution for a traditional genre on these lands to find a new voice and new meanings of expression. Things seem to start moving and it can be seen in a new generation of writers that embraces the genre. 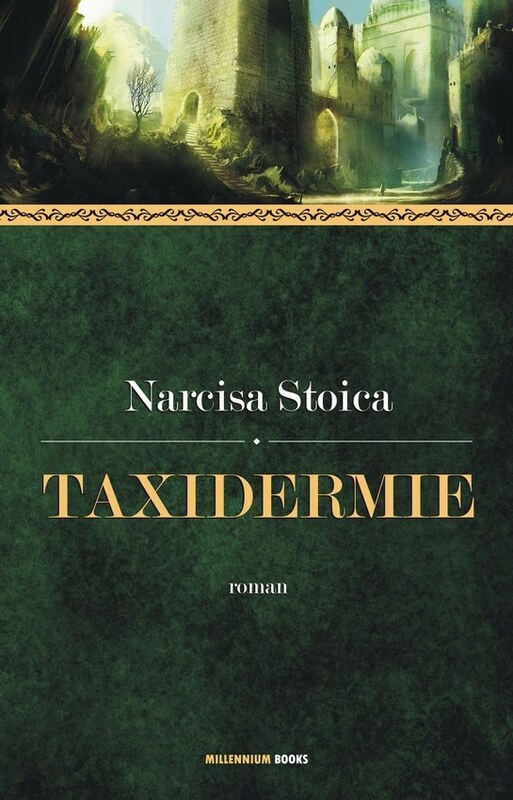 One of these names is Narcisa Stoica who, after publishing a few short stories, made her full debut last year with a fantasy novel, the first in a trilogy, “Taxidermy”. Narcisa Stoica takes a risk making her debut with a fantasy novel, a genre that is not appreciated at its true value and dominated by the books translated in Romanian. But if the same can be said about the general situation of fantasy, despite of its country of provenience, it is difficult to affirm that “Taxidermy” bears the same labels and etiquettes as most of the genre books. It is true that “Taxidermy” plays with a few known tropes of fantasy novels, but those are inevitable in a way and fewer than the elements of originality that give the novel its true color. I would like to go into detail with the said tropes, but in doing so I am afraid I will spoil any reading due to their close connection with the final twists and turns of the novel. It is enough said that in spite of their familiarity they still offer a nice surprise. Despite the easily recognizable elements of other fantasy works Narcisa Stoica’s originality influences the novel and gives it the needed features that make a story attractive. One feature positively affected by originality is the world-building, the adventures take place in a vast empire divided in 52 satrapies. Not only that, but there is a sense of world in the story, there are islands and territories outside the said empire, each more or less independent from it and bearing their own individuality. But individuality is not a treat reserved only to the territories outside the empire’s influence, every single satrap is unique due to one or more particularities. The distinctive nature of each satrap is experienced through the journey made by the heroes of the story, who although pass through only four of these provinces it is enough to reflect the characteristics of the world. The structure of the empire is afflicted and relies heavily on the interconnection between its satrapies, each a cog of the economic and political mechanism. However, despite making the interdependency clear Narcisa Stoica doesn’t explain clearly how this system works. The elements are there, but the cogs’ teeth need to be fitted together in order for the apparatus to start spinning. Of course, to a certain extent this fault can be excused by “Taxidermy” being Narcisa Stoica’s debut work and it would be unfair to compare it with Daniel Abraham and K.J.Parker’s works that spring to mind when it comes to masterfully create a complex and efficient economic system. The Empire of 52 Satrapies functions perfectly and survives due to another uncommon element of the story, the existence of the Resistance. Now, the word resistance has the following as one of his definitions “the act or power of resisting, opposing or withstanding” and has synonyms such as “opposition” and “defiance”. The odd thing about the novel’s Resistance is that it does not oppose anything, on the contrary, its supreme goal is keeping the empire together. I admit that I did not encounter anything similar, but I am not sure that I can complain too much or at all on the matter. It is clear from the story that the army’s influence on each of the empire’s satrapies is not overly great and some see the presence of the empire’s soldiers on their province as purely symbolic. In this context the goal of the Resistance doesn’t seem that odd anymore and the importance of a force keeping things together more significant. Also, giving it a name different from the Resistance would have put the story in another perspective and I am not sure how attractive that prospect would have been. Let’s say that it is a Resistance against the potential chaos issued from the failure of the interdependent economic system. Most of this setting is revealed through various conversations, in principal Jaer Verron’s dialogues with various characters. If to a certain point the technique works after a while in can prove to be bothersome. Jaer Verron is an outsider of the empire with little knowledge to its workings and little access to the little details of the satrapies’ characteristics. But choosing to uncover almost everything this way can put one of the main characters in a bad light. Especially one who is used to at least a little bit of studying due to his occupation. A skilful taxidermist Jaer Verron is no stranger to various tomes and the nature of research, but he seems strangely clueless to the things concerning the empire. The character is saved though by the same detail that seems to be his demise, the occupation. I don’t recall of reading about a taxidermist before, more so in a fantasy novel. This point of view is a very pleasant discovery. Giving more value to the wonderful discovery is the importance of the taxidermy in the empire, the position at it is raised and the importance of this art in the context of the plot. It is such a fresh and encouraging approach from Narcisa Stoica, a diverse change that I would like to see more in the fantasy genre. Obviously, “Taxidermy” is not an endless dialogue with the sole meaning of uncovering its fantastic world. With the exception of the extended revealing conversations the novel is well constructed, the interaction between characters normal and enjoyable, the existent or increasing connection with one another coming naturally. One such relationship in particular develops beautifully, through a nice combination of playful, teasing and serious dialogues. The characters are in constant development, by all means not major changes, but according to the adventures and events they experience. From this point of view the story is constantly moving, there are new things waiting to be discovered around every corner, perils awaiting the characters in their journey, not the darkest and visceral ones but of a lighter tone giving the novel a more optimistic and benign character. And although some of the details of the plot reveal themselves earlier than the supposed moment of truth the story remains enticing to its very end. It takes a lot of courage to make a debut with a fantasy novel on the Romanian market, but Narcisa Stoica is not only brave enough she is also resourceful to make a charming first impression with “Taxidermy”. With more such young talent, as Narcisa Stoica’s, I am certain that Romanian literature would be less reticent towards the speculative fiction.